VL-Series LED Light Duty work lighting is a high value, versatile range designed for many light duty commercial applications. The Optimus Series are LED Driving Lights, advancing lighting technology to the next level. The new Optimus Prime doesn’t sacrifice light output to achieve an ultra-compact housing. The Solstice Solo Prime LED Pod light outputs 1,052 raw lumens from a single 10-Watt LED and outshines most factory halogen headlights. The XPR-S Bar features upgraded IRIS Reflector Technology along with 10 watt LEDs for the Ultimate long-distance light projection. The XPR Bar features IRIS Reflector Technology along with 10 watt LEDs for long-distance light projection. The Low Profile Prime XP is compact for a universal fit with double the light output of the 3 watt Low Profile Bar. The Low Pro Xmitter Prime amber series is optimized for use in heavy dust and fog applications. 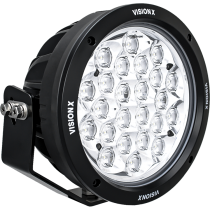 Whether it’s driving home from work or taking a long road trip on the highways, Vision X has a superior range of LED lighting that will not only dramatically improve your visibility, but also increase your safety and the safety of others. Our lights come in all sizes, and there’s an option for any vehicle regardless of size.